* sv Hacker is provided to our customers who bought SophiaCompress(BREW) EARTH or SophiaFramework UNIVERSE, for free. 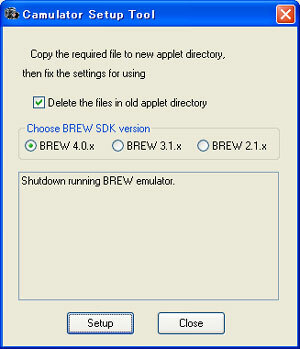 From BREW 2.1, BREW SDK is equipped with camera interface, making it available for BREW developers to develop application which uses camera functions. 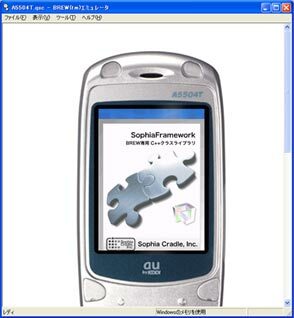 However, BREW 2.1 Simulator does not have camera simulation function, so programmers who develop application which uses camera interface have to do debugging on the actual mobile phone. Since Debugger is not available, applications with camera function took more time to develop. Camulator adds camera function for BREW Simulator, and helps you to develop applications which uses camera function. If BREW Simulator is booted, please finish it. When you change the applet directory and wish to delete the old Camulator file, check on "Delete files in the old applet directory". Sophia Cradle does not offer any technical support for Camulator. Sophia Cradle will not compensate for any damage, trouble or disadvantage caused by using Camulator.